The artist happily accepts commissions for specific sites and sizes. If you would like a painting for a niche, large wall, vertical space, or any special site in your home or office, Murry will consult with you via email and skype, and work within a mutually agreed budget. You receive preparatory plans and thumbnail drawings for your review. Once you approve these preliminaries, the final painting or construction will be executed. 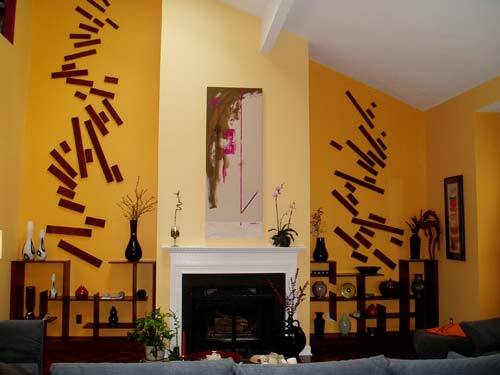 The client asked for a wall arrangement to highlight the 22′ high ceiling with its unusual angles. A dance instructor and body movement specialist, she envisioned something that would “soar”into space. Handler created this arrangement of step-like strips, executed by a master craftsman and finished with a beautiful dark wood glow. The base anchors the arrangement with finished cabinetry of asymmetrical display shelves. Complete Wall Design. The installation includes the entire wall design as well as a painting from the Undial series.